She asked him point blank if he planned to ask her out, so he did. And since their flirtation via podcast earlier this month, Kaitlyn Bristowe, 33, and Jason Tartick, 30, have officially become an item. 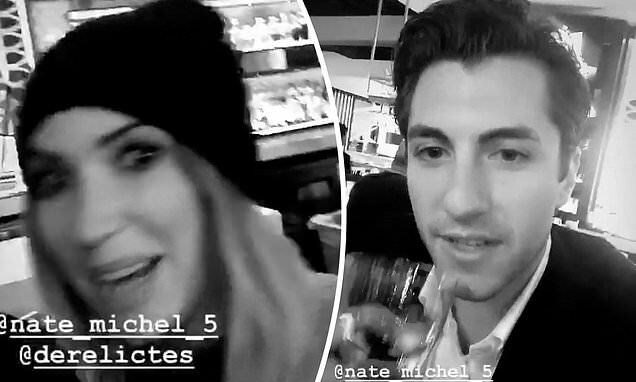 On Thursday, banker Jason took to Instagram Stories to share video of his night out, which included a surprise appearance by Kaitlyn. Jason's evening out appeared to be a guy's night at first. 'There's my boy Nate. He's on the phone with his sweet girlfriend,' he began, as he filmed his friend in the middle of a conversation. 'There's Derek,' said Jason, as he panned his camera phone towards his other pal. Finally, the reality star turned the camera towards himself.